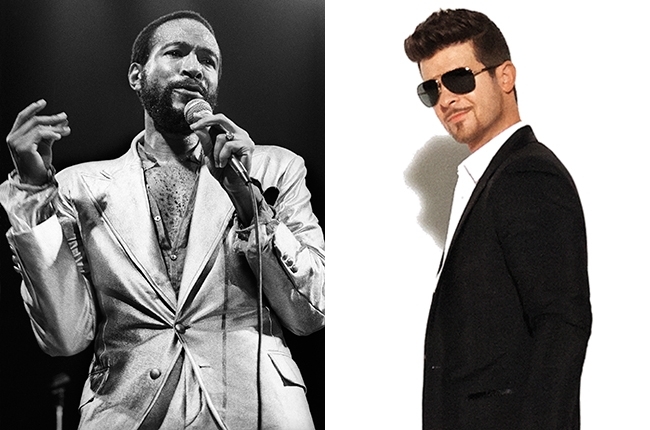 A quick brief for those not in the know; a jury has ruled that “Blurred Lines” by Robin Thicke, Pharrell Williams, and T.I copied elements of Marvin Gaye’s 1977 song “Got To Give It Up” and Gaye’s family were awarded $7.4 million. An injunction is also being sought to prohibit the sales of “Blurred Lines”. The whole issue is a mess but what is especially disparaging is that social media has been ablaze with melodramatic rants supporting “Blurred Lines”, many containing rhetoric along the lines of “A dark day for music”, “The death of creativity”, or “The worst thing that’s ever happened”. (Actual quotes from Facebook and Twitter). This large online contingent seem to think that the Gaye’s are just greedy, that the songs don’t sound alike, and that this will have serious repercussions on the industry. First thing to say is that people should calm down, this is not the first time this has happened and it won’t be the last. The list of similar cases is endless: George Harrison’s “My Sweet Lord”, Vanilla Ice’s “Ice Ice Baby”, Michael Bolton’s “Love Is A Wonderful Thing” to name a few. The only reason why the case has received so much attention is because “Blurred Lines” was such a big and controversial song. Frankly it seems bizarre for so many to be rushing to the song’s defence when not long ago it was being condemned and boycotted. Many people don’t seem to be aware that it was Williams and Thicke who actually initiated the litigation to protect themselves from potential lawsuits by the Gaye family. Quite suspicious behavior for the supposed “victims” in this affair. It transparently shows that they knew from the start that they would be accused of plagiarism but unfortunately for them their actions backfired and they suffered from the very thing they were trying to avoid. This bitter court struggle was entirely the fault of Williams and Thicke and they were ultimately hoisted by their own petard. The fallout from this case may be more settlements as big artists are reminded that they are still vulnerable to losing cases. Like Sam Smith who conceded writing credits for “Stay With Me” to Tom Petty because of the similarities to “I Won’t Back Down” rather than suffer a tortuous court battle like this one. But would it really be such a bad thing for artists to be more thorough about seeking permission when attempting to emulate someone else’s work? Or is it really too much to ask that musicians try a bit harder to be truly original, artistically authentic and genuinely creative? “Blurred Lines” seems to show that over-hyped millionaires are happy to just blur the line between originality and plagiarism.